1 Bedroom, Self Contained Apartment, sleeps two bedding configuration 1 queen bed in master bedroom (can sleep up to 4, double sofa bed in lounge for additional guests, charges apply). 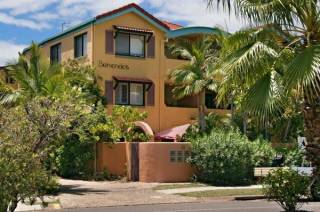 Separate Bathroom/toilet and separate laundry facilities, fully equipped kitchen. Free cable TV/DVD, Free Wi-Fi, direct in dial telephones. Secured gated under cover car park. Breakfast on your private balcony overlooking well-maintained tropical gardens, lunch by the heated pool and BBQs or relax in hot spa! Take in a game of giant chess in the garden, secure a seat under the trees for a tranquil read and then excuses yourself from the kitchen and dine in one of the many restaurants overlooking the river. Book for 4 nights or more and receive cheapest night free. Special 1 night business rate. 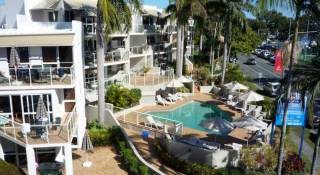 A very warm welcome to Rimini by the River Holiday Apartments in beautiful Noosaville. 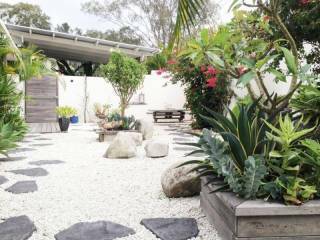 Our friendly resort is situated on a quiet side street just 50 metres from Gympie Terrace on the Noosa River where you can find chilled out cafes, beautiful restaurants, interesting shops and water activities galore! We have 20 one and two bedroom, self contained, self catering apartments that are fully furnished and fully kitted out to be your home whilst you're away from home. Our boutique resort features a heated pool, spa, a BBQ area, tranquil gardens, on site managers and undercover parking for each apartment. 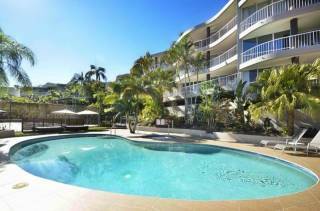 So have a little tour around our website and see what Rimini and Noosaville have to tempt you. Be sure to check out our apartments gallery as each apartment is very different. And check out the videos below to get a better feel for our resort. 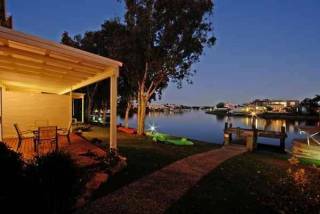 Accommodation Rimini by the River - Noosa your ticket to relaxation ..... so close, so peaceful, so comfortable.... Noosa River Accommodation - come for the experience - relax and enjoy the difference. 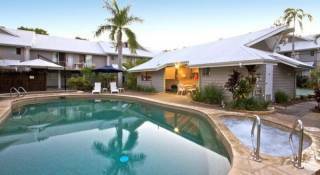 Rimini by the River - Noosa is centrally located to everything you need for a great vacation. The fully furnished self catering one and two bedroom apartments are situated within walking distance to the stunning Noosa river and a diverse array of cuisines on offer at award winning restaurants, cafes and eateries along the waterfront of Gympie Terrace to the delights of Thomas Street; with restaurants serving tastes from around the world as well as contemporary Australian fare will get the mouth watering and the taste buds tingling. This is a fantastic dining precinct to wine and dine relax and sample scrumptious eateries and award-winning restaurants, why not try a seafood platter or Tapas with water views. Everything is so central, you can walk to a major supermarket, Australia Post, chemist, liquor store, florist, butcher, and a variety of specialty stores for all your essential and retail therapy needs at the Mary Street Noosaville Shopping Centre. Or if you are after something special to take home from your holiday there are a variety of gift and retail outlets along Thomas street and Gympie terrace. Check in is at 2pm. Our office is closed at 5pm Mon-Fri, 3pm Sat and 12 noon on Sun/Public Holidays. If you are arriving after this time, please call us for late arrival procedures. Departure is at 10am. Balance of account must be paid in full on arrival or paid prior to arrival if arriving after hours. Our apartments are self contained. Bookings of 8 days plus will be serviced midway through your stay. Additional linen or hire items during your stay can be arranged at a nominal charge. If booking is cancelled inside the 28 day period the full deposit is forfeited with and no refund will be issued however the guest can request we can hold the deposit over and move the booking to another date with a new booking date within 6 months of original booking. You may view a full copy of the terms and conditions of your booking below. Rimini holds all deposits and payments in an audited Trust Account (as required under the Queensland Property Agents and Motor Dealers Act 2000). Any interest paid on deposits/funds held in trust is not retained by Rimini but rather by the OFT. The value of your first night's accommodation - or $175 (whichever is the greater) - will be taken as a deposit to secure your booking. The deposit may increase at the manager’s discretion dependent upon the monetary amount and length of booking. Upon receipt of your deposit your booking will be processed. We will then email you a booking confirmation letter which includes a deposit receipt. A booking is not confirmed until such time as a deposit has been received by us. The balance due on your account is payable upon arrival. Please note that if you are arriving outside of office hours the remaining balance will be deducted from the credit card provided and the receipt will be in your arrival pack with you keys. - If the booking is cancelled inside the 28 day period then the full deposit is forfeited. Where a guest has already paid their account in full, the difference between the cost of the deposit (e.g. the cost of the first night's stay or $175 - whichever is the greater) and the balance will be refunded.